Zenith Nutrition Astaxanthin is a natural antioxidant carotenoid derived from the fermentation of the microalgae Haematococcus pluvialis. It may promote a healthy inflammatory response, support skin during exposure to sunlight and support joint and eye health. It is an antioxidant that naturally reduces free radicals and reduces the oxidative load in the body by protecting the cells against oxidation. It has a strong antioxidant activity and UV-light protection effect, an excellent supplement for eye health maintenance. It also helps improve heart heath, cellular health, and the body's immune system. Supports skin during exposure to sunlight. Protects the cells against oxidation. Helps improve heart heath and the body's immune system. 100% vegetarian capsules with anti-oxidant benefits. Explore the entire range of Antioxidants available on Nykaa. 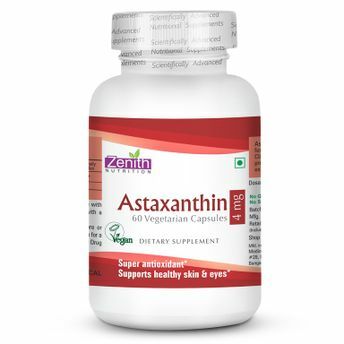 Shop more Zenith Nutrition products here.You can browse through the complete world of Zenith Nutrition Antioxidants .Alternatively, you can also find many more products from the Zenith Nutrition Astaxanthin 4 Mg Capsules range.